The Calgary Comic and Entertainment Expo was this past weekend. I had never been before, but I had an idea of what sorts of things, activities and people I was going to encounter. I knew that every video game playing basement dweller in the city would be out and people would be heinously getting their geek on. So I wasn't too surprised at what I experienced. People in crazy costumes, lots of long haired dudes with glasses from 1994, millions of conversations about (what seemed like) super important things I have never heard of, and of course a dirty stench that smelled like rancid onions eaten by people who bath as often as people did in the medieval times. It got kind of sick. 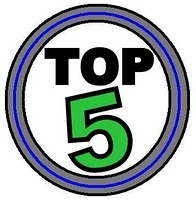 Here were my top 5 experiences from the Expo, you may live vicariously thorough me if you were too terrified to go yourself (I don't blame you). This was surprising...I didn't know that the Expo had a musical component. 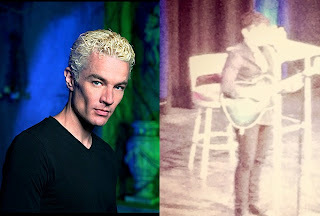 I also was unaware that James Marsters, who you would know as Spike from Buffy the Vampire Slayer, was also a musician. 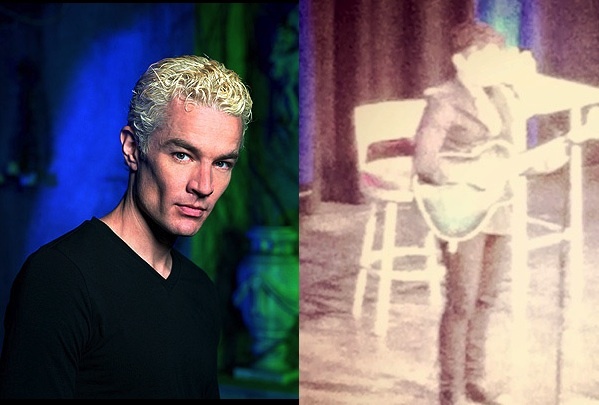 Based on what I saw Friday, he's not that good and probably only plays things like ComiCon where people will come see him for the Buffy factor, not the music factor. He also sang this creepy 'your a dangers girl' song about Michelle Trachtenberg from when she was on Buffy with him...it's creepy because she started on that show when she was 15 and left when she was 18. SIIIIIIIIIIIIIICK (he was 37). The Expo is one big cash grab...they use Z-C list celebs to draw in the nerds and then they charge from $10-$500 for an autograph. How sick? Looking at the list there was only one person I would even think of paying to see: Wil Wheaton....and not because he was in Star Trek, but because he plays himself on The Big Bang Theory which is one of my favorite shows. Anyways, I got his scratch on a picture of him and Sheldon bowling and then we fist bumped. Also...I waited in line for this for exactly 3.5 minutes. Other people waited to see old dudes for HOURS. So weird. 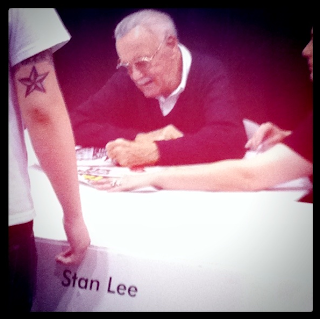 I saw a guy get Stan Lee's autograph on his shoulder and then get in line to get it tattooed on permanently. I didn't stick around to see if he went through with it, but most of those people are insane, so I am going to go with yes. Oh, and if you didn't know who Stan Lee was...he is like the Godfather of Comics, aka a Nerd's Jesus. 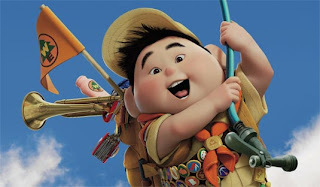 The fat kid from Up! Best costume of the expo...one of the volunteers was dressed up as the little Boy Scout from Up! (He was a grown man, but it was still legit). It was pretty funny...and not terrifying like most of the costumes. This was probably more annoying that anything else, but it was still a big part of the Expo. The only one I waited in for any length of time was in the Stan Lee autograph line with my cousin (I know, I'm a saint)...it was 3 hours. 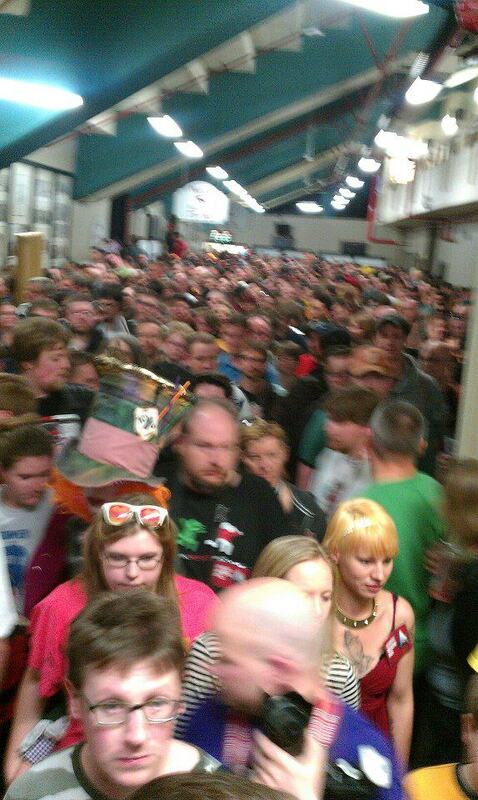 But I guess there was almost a nerd revolt outside of the doors as the fire marshals cracked down and they stopped letting people into the building who had pre-bought passes and photo ops. Later I felt bad for like a second that I took up body space in nerd mecca when I am not a nerd, but then I got over it. So that's it. I am not sure that I would ever go back to the expo...it's an experience, but not really my thing. Paying to stand in line for an autograph seems outrageous to me and going somewhere that smells that bad on purpose just seems ludicrous. I'll leave the geeking out to the true geeks. How is it that no one I know went to see LeVar Burton? I am flabbergasted!